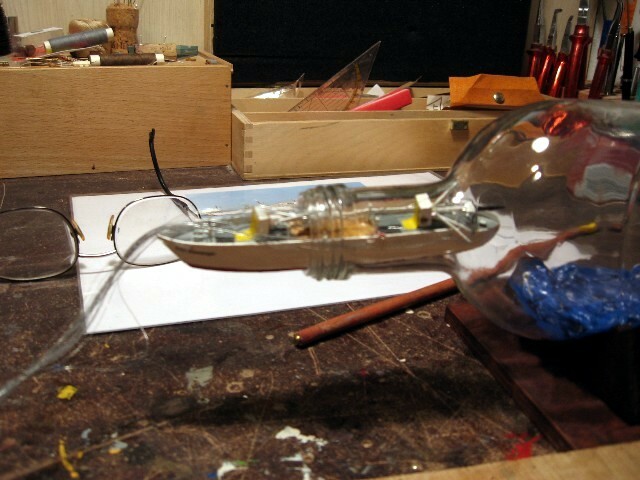 Building a ship in a bottle means to fold the masts to make it possible to move the model into the bottle. 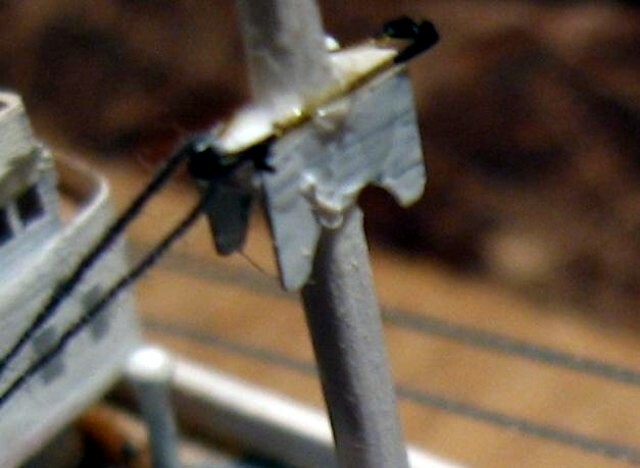 When building a model of a conventional freighter with loading-gear you’ve the problem that the masts do not have any kind of shrouds and stays to hold them in a vertical position. 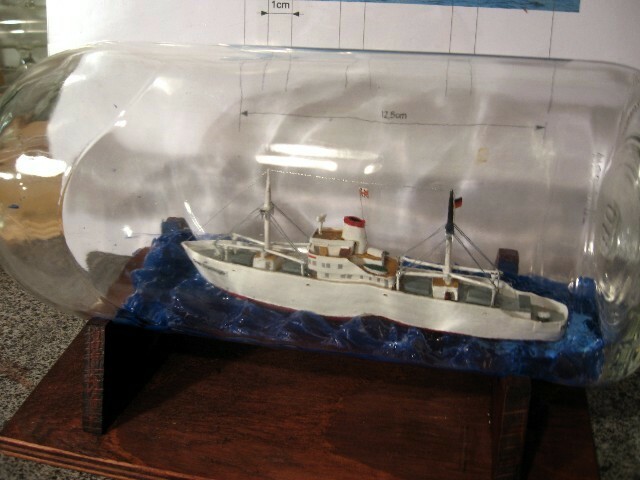 While constructing the model of the freighter CAP DOMINGO I had to find a way to move the two masts without using a kind of hinge. The solution was to fold them together with the deckhouses they were built on. 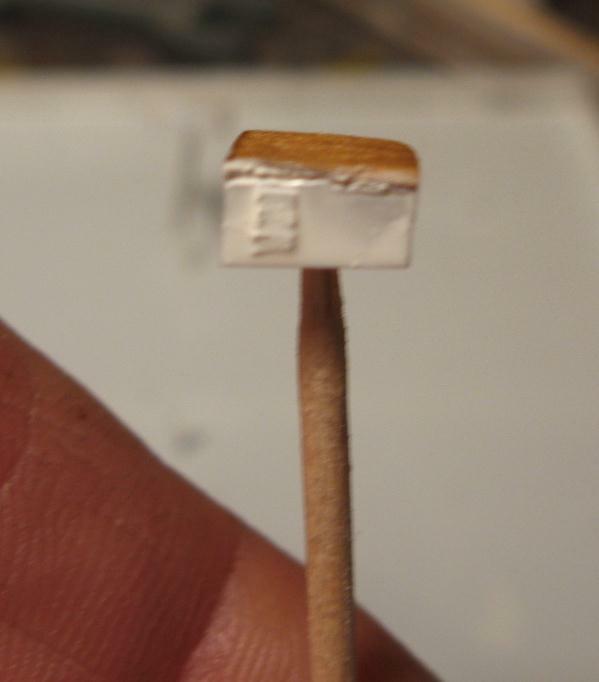 First, I fixed the deckhouse on an assembly-platform. The mast is placed in a good fitting hole in the middle of the deckhouse. The derrick-pin for two derricks at the time, each beside the mast, is made with a small ring of thin brass-wire going through a small pearl and in holes beside the mast position. The derricks themselves are made of 0,8mm injection-needles, so I can move a gray thread from one end of one derrick, through the ring, through the second derrick. So they are together, movable, and I’ve the first part of the lift-rope for each derrick. The masts have in a height of 2/3 from the bottom the crosstree with another ring on every side. There through the lifting-rope goes. In the boomhead I can stick another ring, where i can lead the lifting rope through. Now I can move the whole boom-arrangement by pulling only one thread. To fix all this very thin rings I use as usual my favorite glue – nail polish. On the boomhead there is the need of another thread, the runner. I use another colored thread to find them out afterwards and it has to be knotted at the very end of the boom but in a way that the lifting-rope is still movable. Both threads are going through another ring on deck later on, situated vertical under the boomhead of every derrick. All these rings, made of brass-wire with a diameter of 0.5mm, are simply made like a loop with both ends pushed in a 0,8mm hole using nail polish to fix. 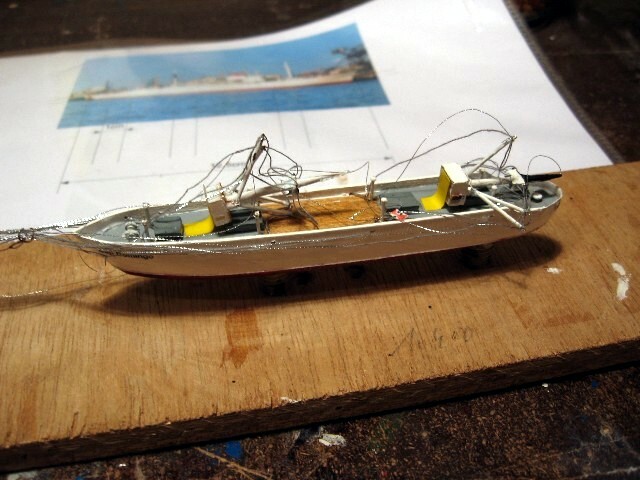 If I would build this model in a bigger scale I would construct some winches as well, but in this case I lead the threads direct through the nearest hawses off the model to the rigging stand. 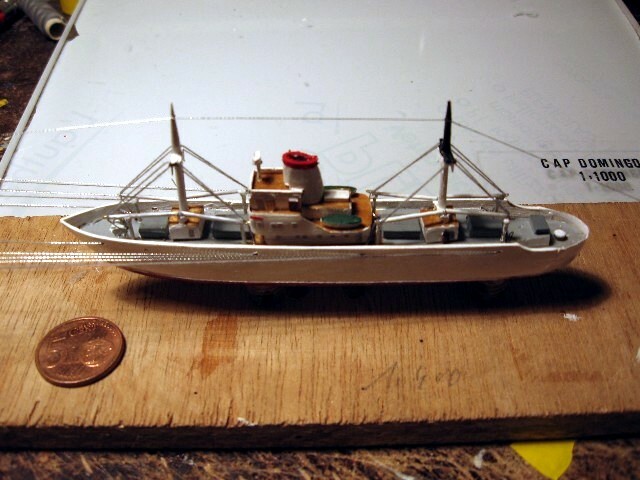 Finished the arrangement with the loading gear I can put it on deck of the model. To keep the moving while I fold the masts backwards under control I fix the deck houses with small stripes of tape on deck. 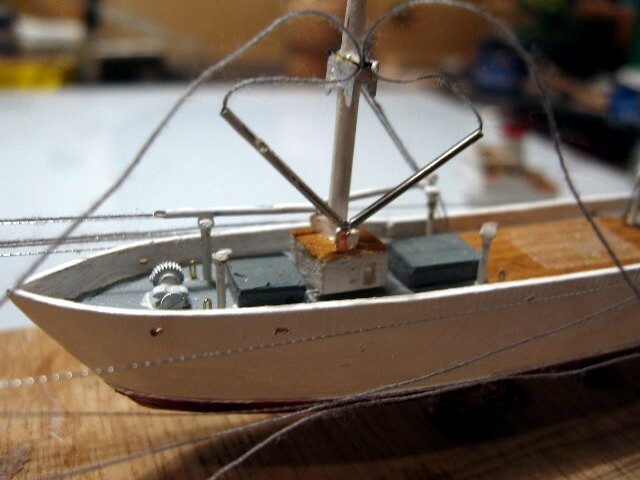 To pull the masts in there end position I fix an auxiliary stay on top of the aft one. On the top of the fore-mast I have to position another ring where i can lead the thread. In this stay I have to fix a figure eight knot on the right position which takes the foremast with it while lifting the aft mast. This auxiliary stay has to stay on the model, so I have to give him a function. In the middle between both masts a flagline can be situated so the auxiliary stay gets to be a radio aerial. With this reason I use a special, silver colored, thread for this application. 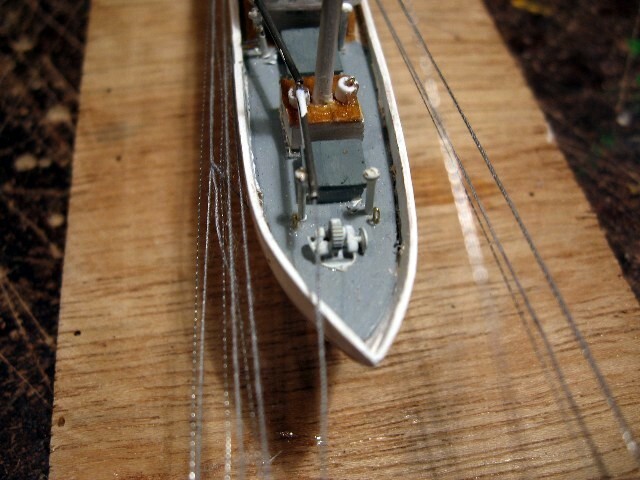 The radio aerial is leaded through another ring on the starboard side of the funnel because the whole main-deckhouse can be brought on deck just after both loading masts are finished in rigging and the flagline can help me to stiffen the whole arrangement. When it is finished and all the threads are tightened I can fix them all with a drop of nail polish in the small ring where they are leaded at last. Outside the ship, where the threads leaf it through the hawses I can cut them later and pull the rest back on deck with a fine bent needle.